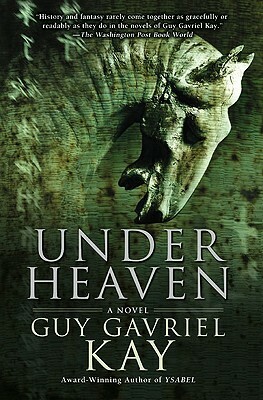 View our feature on Guy Gavriel Kay's "Under Heaven. "In his latest innovative novel, the award-winning author evokes the dazzling Tang Dynasty of 8th-century China in a story of honor and power. Inspired by the glory and power of Tang dynasty China, Guy Gavriel Kay has created a masterpiece. It begins simply. Shen Tai, son of an illustrious general serving the Emperor of Kitai, has spent two years honoring the memory of his late father by burying the bones of the dead from both armies at the site of one of his father's last great battles. In recognition of his labors and his filial piety, an unlikely source has sent him a dangerous gift: 250 Sardian horses. You give a man one of the famed Sardian horses to reward him greatly. You give him four or five to exalt him above his fellows, propel him towards rank, and earn him jealousy, possibly mortal jealousy. Two hundred and fifty is an unthinkable gift, a gift to overwhelm an emperor. Guy Gavriel Kay is an internationally bestselling author. He has been awarded the International Goliardos Prize for his work in the literature of the fantastic, is a two-time winner of the Aurora Award, and won the 2008 World Fantasy Award for "Ysabel." His works have been translated into twenty-five languages. "I loved, loved, loved UNDER HEAVEN. It had everything in it that made me such a fan of Guy Kay in the first place. I thought the new one was perfect." -Nancy Pearl, Book Commentator NPR "Morning Edition"
"A magnificent epic, flawlessly crafted, that draws the reader in like a whirlwind and doesn't let go." "Guy Gavriel Kay's fictional rendition of the Tang dynasty of ancient China in Under Heaven reads almost as a historical document. For anyone who enjoys a smart political thriller, a historical recreation or a good ghost story, this novel offers all three in an immensely readable union." "Guy Gavriel Kay, hunting in the twilight zone between fact and dream, has written a shimmering novel, a fantasia on T'ang China, the epitome of Chinese civilization, as beautiful and as alien as the rings of Saturn... a beautiful, compulsive read..."
"Under Heaven is virtually everything a reader could want in a book: a thrilling adventure, a love story, a coming-of-age tale, a military chronicle, a court-intrigue drama, a tragedy and on and on. It is a sumptuous feast of storytelling, a beautifully written tale with a beating, breaking heart at its core that will have readers in tears by its final pages."